While this is very interesting and commendable in terms of efforts that students are putting, it made me think about the state of mind of students who are scoring between 60 to 80? The cutoff percentage even in small towns is anywhere between 85 to 95 percent so then where should an 80 percent student go? And this is the state across cities or small towns. Interesting fact is that as per the recent study done by The World Bank and Stanford University found that Russian and Chinese engineering students are better than those in India. Indian students make substantial gains in mathematics and critical thinking skills in the first two years of their education compared to their counterparts in China and Russia, but their overall higher-order thinking skills are substantially lower than the Chinese and Russians. Not so long ago, another survey done by Aspiring Minds suggested that 95% of engineers are unfit to take up software development jobs. Another survey stated that more than half of Indian students do not possess the skills required for employment even as they are educated. So, that really made me think, what kind of education are we providing here? The above studies show that there is a serious lack in terms of quality of education. 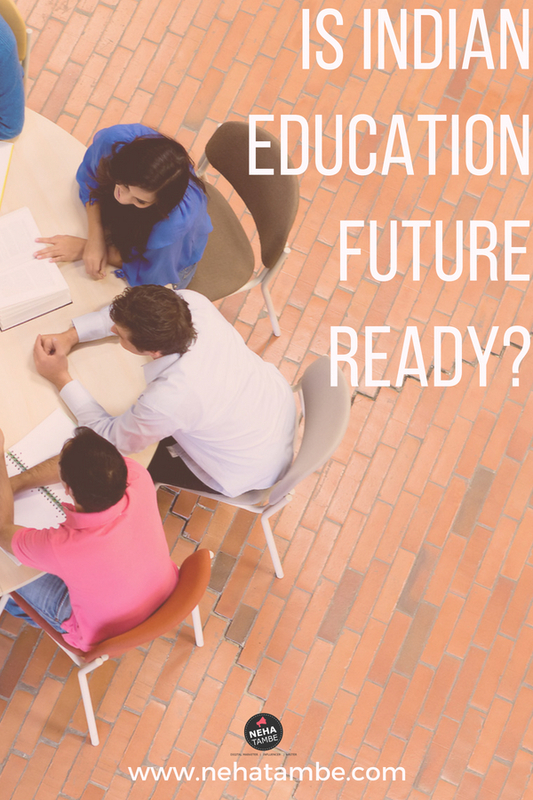 There is a huge gap between the expectations of industry and the kind of education we are imparting. 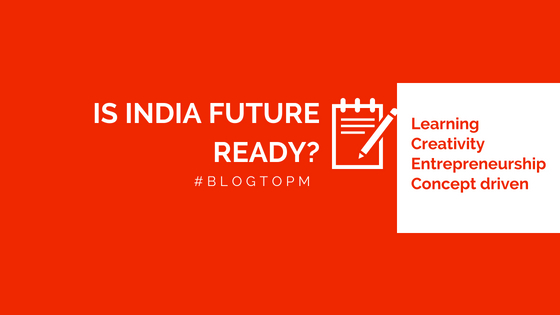 I recently came across BlogToPM initiative by blogadda. It was interesting and I would like to focus on education here for this post. India today is facing a peculiar problem. There is enough awareness about importance of education, however the schools have failed to reached all over India. My maid has a big farm in her village however she refuses to go there and continues living in the city with bare minimum facilities only because her village does not have a school and if they leave their children will be left without education. Whereas not so long ago I read an article where they mentioned that schools in many villages in Maharashtra were being shut down for lack of students. This is an ironic situation that needs deep understanding and quick solutions for better educational systems. On the other hand there is fierce competition among those who are privileged to get an education. They are competing for every percentage. Almost every other child is scoring above 90 and yet maybe without a job in the future. What we need today is not thousands of average employees but someone who can come up with ideas that will be fortune 500 companies in the next 10 years. A different kind of education is required where entrepreneurship and creativity is nurtured and the focus shifts from employability to entrepreneurship. Encouraging the startup culture, creating startup incubators in renowned universities in India is the first step towards such shift in thought that will lead to a future breed of entrepreneurs. Promoting collaborations between research institutes and public-private companies for better research and homegrown inventions. Driving digitalization to improve speed of knowledge and learning. Digitalization in payments is empowering India to partner with the world. Overhaul the process of teacher training. Look at the best teaching methods incorporated by schools world over and offer world class training to the teachers in the making. We need to invest in quality teachers for quality students. I recently visited Bhutan and got to know that education is free in Bhutan however it is free only till the child performs well. I think that approach makes more sense as, instead of just offering freebies like free books, free meals, free bag etc. the emphasis should be on learning. Earlier Bhutan used to follow Indian curriculum for education, however they soon realized that it didn’t fit their countries narratives. Also they were keen on introducing Bhutanese culture to their students rather than Indian history and culture. The king of Bhutan called in experts from world over to design the education system that is important and useful for Bhutan and today that is what is being taught across Bhutan. Apart from the regular subjects there is equal emphasis on sports like archery (national sport of Bhutan) and football. Apart from this, courses like weaving, sculpture and painting (Bhutanese traditional art forms) are considered mainstream education. After basic education the children can choose respective fields and even specialize in arts like sculpting, weaving, painting etc. We even visited a school that was a boarding school with specialization in textile, sculpture and painting. The students there not only learnt the art, but had even set a shop where things made by them were being sold. I think this is a great idea for fostering entrepreneurship while preserving the traditional art forms. Singapore is another country that focuses on its education. Instead of the same curriculum everywhere, they have special schools that focus on certain talents. A child can choose a school that will help him or her major in fields like art, music, sports etc. These schools put more emphasis on a particular field and the pass out’s from those schools, then find it easier to get admissions in relevant colleges (national and international) The focus is on fundamental building and the students are prepared keeping in mind the world competition. Schools that are shut down for lack of students could be converted into boarding schools. We can ensure that the education is free provided the children put effort and score x % this will help get maximum students from all the nearby ‘dehaat’ and ‘kehdas’. As travel, which is a major concern for most parents will be taken care of! This will work in two fold, when the teachers will be more aware about the child’s talent as they will be spending maximum time with the children. Also the percent criteria need not be only for education. If the child excels in even 2 subjects, he/she should be provided free education. Some students might not score well in traditional subjects like science and mathematics but might be excellent in languages or sports! Children should be taught life skills that are relevant in their area like – farming, weaving, painting, sculpting, forestry, beekeeping, culinary skills etc. During the board exams, the teachers say in relation to the kind of subjects the child should choose, should be considered. This will help in nurturing the inner talent of the child. There should be equal weightage given to skills like, sports, farming, weaving, design etc. and if a child excels in that, they should be given free education for that subject till graduation. The schools can become boarding schools on the lines of Navodaya Vidyalayas. Regular schools should have compulsory skill development subjects. The focus should not be on creating hoards of student population that is scoring 90% but on creating individuals who are job ready, and are entrepreneurs. Inculcating these ideas from childhood, will prepare the children in terms of handling pressure and facing competition. With such a rich cultural heritage and century old dominance in the field of art, India should inculcate this idea and introduced specialist schools that will focus on introducing, promoting and marketing Indian traditional art forms like weaving sculpting, paintings, embroidery etc. Allied fields like preserving those art forms, curating museums, protecting bio diversity etc. should be accepted and promoted just like a regular engineering degree. Moreover, introducing new and fun methods of learning can also make a huge difference. For example, the schools and institutes can invest in various educational toys which can make learning a fun process for them. School syllabus should focus on concepts and implementing those concepts. If a child is studying about money, the class can put up a stall where they handle real money. If the children are being taught about germination and farming, they could grow a patch of vegetables or flowers in the school. Languages should focus on reading and introducing them to authors and their stories. If the primary education focuses more on this rather than creating models that most of the times are creative expressions of parents, or writing hundred question answers, the children would truly be world ready. Next important aspect that we should focus on is the dignity of labor because then every child has the true potential of creating a future for them. No job, if being honestly done, should be looked down upon. We all need plumbers, architects, contractor and shopkeepers. A job well done is important than no work being done at all. Reducing Stress or Impending Doom? It’s time we stop giving freebies and pushing children to the next class for the fear of children being stressed. We are just reducing the standard of education in our society. I have seen children who are in high school, and will soon face board exams, are incapable of create a single sentence without mistake. The basics revolving around addition, multiplication and division itself are not strong. What is the point of having such masses of educated illiterate? We have the degree but are not employable? Never having faced any kind of competition, these children will be more susceptible to stress and stress related problems when they go out in the world and suddenly compete with lakhs of students for a few thousand seats or jobs. I hope we can create a new generation that is smart on their feet, and know that hard work is always rewarded. The world does not end, if you score less or even fail an exam. The important thing is how do you pick yourself up and find something that gives meaning to your life and a passion for your heart! Extremely critical insights Neha and I am glad I am witnessing a positive change in many Indian Schools too with more emphasis on concept education and application testing. Well written. So many points leap out here. The system is definitely on a downhill trend for me right now… It is insane to think we have cut offs at 90% or even 99% as we read in the papers. Bhutan’s incentive driven measures for free education is one way to bring the students away from the mills and back into school. But so much more still needs to be done. This is such an insightful post, Neha. Our education system focuses on rote learning rather than in-depth learning/understanding of the subjects, skills, critical thinking, ingenuity and life-long learning. I love the example you shared from Bhutan. It’s so useful and the learnings from the school can be used in later life too. Those are great suggestions. Hope we learn from the past experiences and transform our education system. Quite informative posts. The promotion of start ups and collaborations between research institutes and PPC is something I have really admired as an initiative for education and promoting Indian brains. This post has many aspects of education sector that is effecting Indian literacy growth. Only when the villagers will be given opportunity to educate and earn well for themselves, the country will grow as a whole. Extremely well researched and well written post. There have been many schools who have understood the need of the hour and Incorporated many changes you mentioned here. You nailed it Neha. Indian education system needs many changes and the top of the list should be hands on education like what you mentioned in the handling real money. That will give them the actual experience and they will learn the concept in a better way rather than just mugging up the concepts from exam point of view. I think the education in some reputed private schools is still pretty good, but I don’t think that should be the focus of the government or the other stakeholders. But, the truth is, the population and the lack of quality of teachers makes it impossible to provide quality education to those kids. But, technology can play a huge part in this. If the government or some private players make elaborate online courses for free in different regional languages(from standard 1 to standard 12), and making courses that are easy to understand and fun for kids, then that would be a great way to provide some level of quality education to those kids, and to make them capable of performing well with the private and city schools students. I came across this article recently, thought of sharing it with you ! very insightful article I totally agree on your points and I especially consider that skill development should be integral parts of teaching. grading fish on its ability to climb tree is stupid when her talent lies somewhere else. You nailed it Neha..I agree on many points you mentioned and raised questions…time to rethink .. Beautifully covering all the flaws in the system, your post gives detailed insights on today’s education system. A well-researched article. Good analysis of what ails the Indian education system and what needs to be done! An eye-opener indeed. I hope government is aware of the drawbacks of Indian education system. Your suggestions are worth following. Thanks for sharing. I was really impressed to know about the Bhutan and Singapore education system. Thanks for sharing. My son will be entering nursery next year and I already worry about the amount of pressure there in on kids. A friend of mine switched her son from national board to international board with triple the fees, just because her son could not handle the pressure and this is in the 1st grade! Something really needs to change in our education system. An article packed with a multitude of good ideas. We do need an education system which is concept based. Haven’t heard of the mobile schools idea before. Wonderful concept. Valid point and it requires close attention to work out for rising unemployment. Yes, I Vote your skill development idea among young students. Many of the students get suffer to make a steady career themselves due to lack of skills and self-management. The government should immediately take some adequate measures to reach the “skill India” project to the below poverty line students, that makes them gain some basic skills to face the new India. This shows the stringent learning pattern our generation and generation “Y” is following. If we abide us in these traditional learning, then we won’t be able to produce great creators in India. The learning should be personalized and must be accepted from the parents front also! We, as a startup founders know that if kids are creative and guided by their curiosity, they can make our future great! We just need to kindle their creative instinct at the early stage! Thanks Neha for this post. Very exhaustive post. You have touched every corner of the subject. I feel the biggest challenge for the Indian Education System is the curriculum. There is a vast gap in our college education and corporate. Our colleges produce graduates but unfortunately, they are not industry ready. To become industry ready after college they need to take some extra training. Other points you have already covered. I think this is a very good read for people who are sitting at the top in our education system.